There are a few important reports on the U.S. economy worth mentioning this morning. 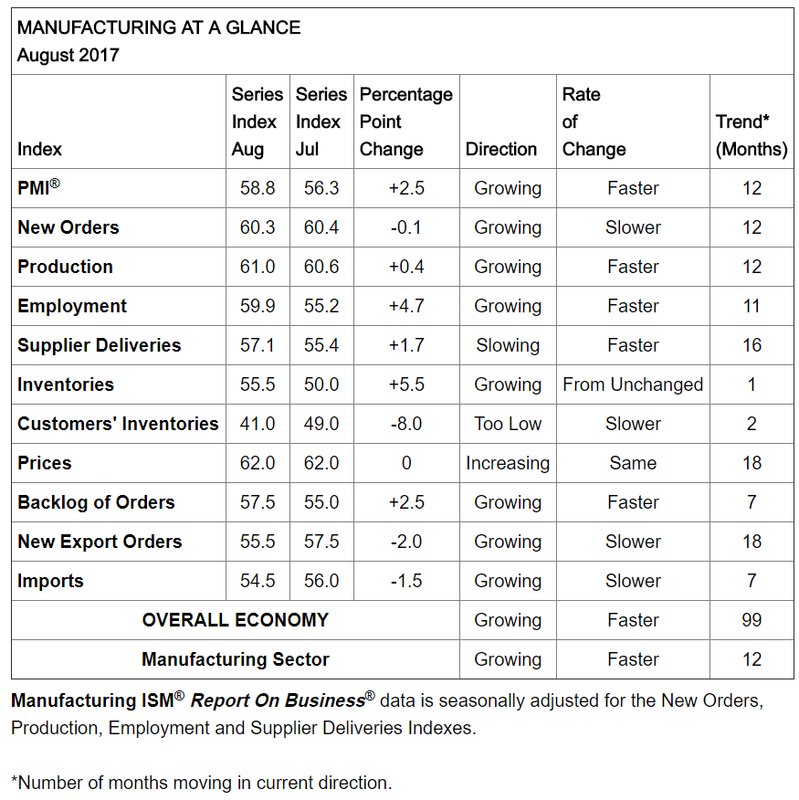 First, the manufacturing purchasing managers' index (PMI) from IHS Markit fell to 52.8 in August, due largely to "subdued foreign client demand that limited growth in production." 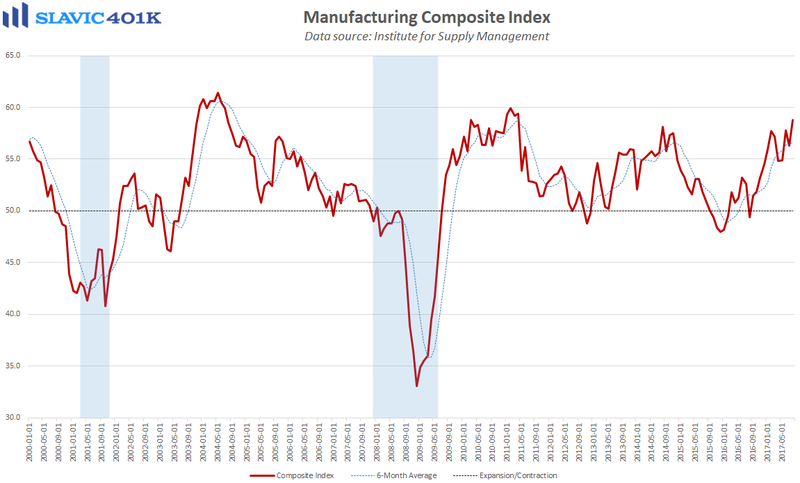 Despite the decline, it is important to remember that any above-50 reading still signals an ongoing improvement in operating conditions across the U.S. manufacturing sector. Further, total employment expanded at the strongest pace in six months in August, and Markit’s chief economist Chris Williamson added that “the survey brings more encouraging signs of improved domestic demand, with orders for both consumer goods and investment goods such as plant and machinery on the rise, boding well for the wider economy to continue to expand as we move through the second half of 2017.” Even more encouraging is the Institute for Supply Management's (ISM's) manufacturing index, which rose to 58.8 last month. That was a much better gain than expected and the highest headline reading since June 2011. Under the hood, measures of new orders and foreign trade deteriorated but production and employment improved. 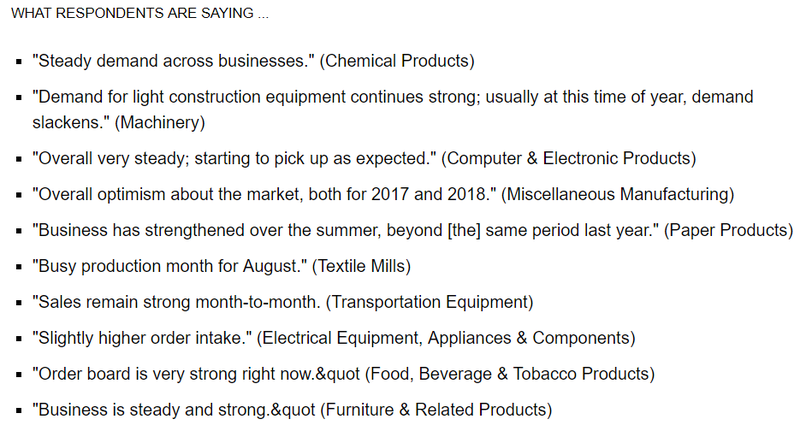 Comments from surveyed managers were generally positive in August. Elsewhere, a report from the U.S. Census Bureau showed that construction spending in America grew at an adjusted annual rate of $1,211.5 billion in July (lagged release). That was a decrease of 0.6 percent from June, the second monthly decline in a row, and significantly worse than the 0.6 percent gain economists had anticipated. On a year-over-year basis, headline construction spending expanded by just 1.8 percent in July, the slowest pace of annual growth recorded since November 2011. 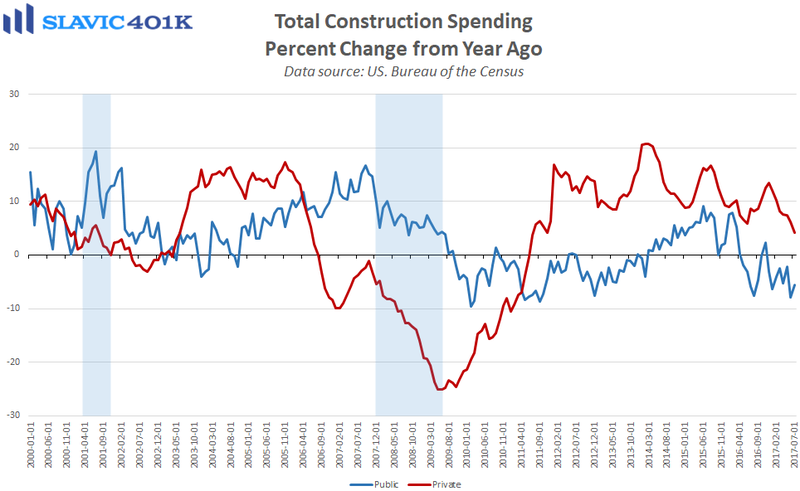 Most of the weakness, though, has occurred in the public-sector, whereas private-sector construction investment has lost a bit of momentum recently but is still up 4.1 percent over the past twelve months. A rebound is of course possible in the public arena once Congress and the new administration are finally able to move forward with their plans for major infrastructure investment. However, in the term this report will likely cause some analysts to lower their estimates for U.S. gross domestic product (GDP) growth during the third quarter of 2017. In fact, the Federal Reserve Bank of Atlanta cut its Q3 GDP projection from 3.3 percent to 3.2 percent immediately after the release of this report, and Goldman Sachs similarly dropped its growth forecast from 2.8 percent to 2.7 percent.